Life. Plans. Hope. Dignity. Death. And Life again. Here Sister Joan reflects on all this and more. These succinct seeds of wisdom are imbued with a deep awareness of God’s love for us through all the joys, failures, misunderstandings, and questions of each day. 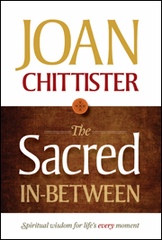 “Life,” says Sister Joan, “is about doing the best you can in the moment in which you find yourself so that, eventually, you can find yourself even wiser than you now are.” Brief yet powerful, these meditations are perfect companions for each day of life’s journey.